"Apparently President Obama, as educated as he was, doesn't know his history. Or is it that he knows but won't admit to it? This is not only an insoluble element of his function as president, which is to tell lies, but part of the education of Puritan hypocrisy. The United States has never recognized itself as an empire, allowing it the luxury of condemning the imperialism of other empires in the name of freedom. ... Russia, on the other hand, arrogantly boasts of having been an empire for centuries, hoping to remain so." 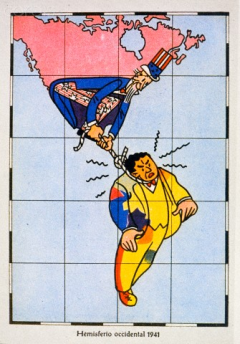 A 1941 postcard depicting the Monroe Doctrine and relations between the United States and Latin America. Barack Obama, usually so careful with his rhetoric, let slip an unfortunate phrase a few days ago. At a press conference after criticizing Russia's annexation of Crimea, the U.S. President said, "You know, we (the United States) have considerable influence on our neighbors. We generally don't need to invade them in order to have a strong cooperative relationship with them." "Generally" not? The United States has invaded its neighbors in the Americas at least 29 times during its brief slightly over two century history, starting with its failed attempt to annex Canada in 1812 (even though before that, it had had its eye on Mexico, and before the war against slavery, on Haiti). Then, after a pause dedicated to eradicating the enemy within - the native Indian tribes, came a list, as the crow flies, of countries to invade. Following the declaration of the Monroe Doctrine  on the divine right of the United States to rule the entire hemisphere, the first large-scale invasion was of Mexico in 1846, after which half the country was seized (what is today Texas and California). In 1855 came the occupation of Nicaragua and neighboring countries El Salvador and Honduras - in order to reestablish slavery [the filibusters]. 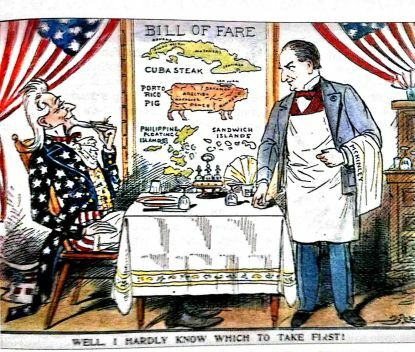 In 1898 followed the occupation of Cuba, which included the conquest of Puerto Rico and the remote Philippine islands in the Spanish-American War. The takeover of Panama came in 1903. In 1904, the Dominican Republic. In 1906, Cuba again, in 1908, Panama again, and in 1910, Nicaragua once more. Almost every year, between 1911 and 1927, there were invasions and either temporary or permanent occupations in parts of Mexico, Haiti, the Dominican Republic, Panama, Honduras and Nicaragua. A respite followed until 1954: Guatemala. Then came fleeting interventions or interventions by proxy; such as the recruitment of anti-Castro Cuban exiles in 1961 by the CIA, local coups d'etats in Brazil, Uruguay, Guatemala and Bolivia, the bloody 1973 coup d'etat in Chile organized by U.S. Secretary of State Henry Kissinger; the coup d'etat of the Argentine generals; the invasion of the tiny Caribbean island of Grenada in 1983, and the bombardment of Panama City the same year. That doesn't include wars and invasions of other countries on other continents - in Europe, Asia, Africa, as Obama says, to "enhance cooperation" with those who have been invaded. Nor do these include the hundreds of military bases that have been established, like the one Russia has in Sebastopol in the recently annexed - or better said re-annexed - Ukrainian peninsula of Crimea. Apparently President Barack Obama, as educated as he was at the best universities, doesn't know his history. Or is it that he knows but won't admit to it? This is not only an insoluble element of his function as president, which is to tell lies, but part of the education of Puritan hypocrisy. The United States has never recognized itself as an empire, allowing it the luxury of condemning the imperialism of other empires in the name of freedom. Russia, on the other hand, arrogantly boasts of having been an empire for centuries, hoping to remain so. So now President Vladimir Putin says that the "bravery of Russian soldiers restored Crimea to the Russian Empire," referring to the wars of Catherine the Great, named so after the wars she waged. In the years of the Cold War, these two empires, Russia and the United States, became almost hegemonic in their respective halves of the world. However, the collapse of communism has stripped them both of their masks, leaving them almost nakedly imperial. Russia can no longer portray itself as a promoter of the socialist revolution, nor can the United States disguise itself as the defender of freedom. 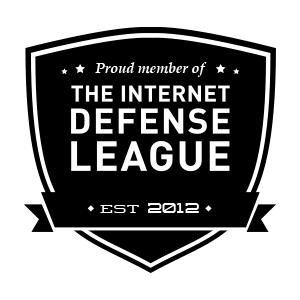 Each has been reduced to the promotion and defense of their respective national interests. How has this happened? Through what Obama calls "cooperation." That is, the same thing he criticizes Putin for: the use of force.